Evenly Matched was one of the card that got everyone talking about the set. Any trap you can activate from your hand deserves looking at. The power this card possesses is crazy. You go second. Enter your Battle Phase, end it, and play this card. Your opponent instantly loses cards until they are equal with the amount you have, and the ones they lose go face-down out of play. A one card field sweeper when you play nothing. You can only activate this from the hand if you control no cards, but that is perfectly fine. Swift Scarecrow or Battle Fader can protect you, but that will be one less card for you to banish. Cards that gain effects off being banished won’t gain their effects. Your opponent can still summon in Main Phase 2, and it’s unlikely that they will have set spell/traps before attacking, but that is only if you do this during the early turns of the game. Even set this card can be just as devastating as it is in your hand. This card punishes over-playing and attempting to OTK. It is over-powered, but can be just what some decks need to compete against better decks. Evenly Matched is a free Normal Trap Card. Drawing multiples is fine because there is no once per turn restriction on this card. You can activate it from your hand if you control no cards. But what does it do? Once activated at the end of a Battle Phase, you banish your opponent’s cards face down up to the number that would make both players have the same number of cards on the field. This is a perfect side deck card, especially when going second. It’s also a great main deck card if your goal is to play Black Rose Dragon, and then remove any leftover cards that might have triggered. This gets rid of cards that might not be able to be destroyed. It also obviously doesn’t target. Frankly, Evenly Matched is Trap that really lives up to the name trap. If your opponent over extends the field, they’ll be left with one card and a prayer. We are getting into the Top 3, which are some really good cards. The number 3 for us is Evenly Matched. Evenly Matched is a Trap card that can only be activated at the end of the Battle Phase. Once activated, your opponent banishes cards on their field face-down until they control the same amount of cards as you. For example, if Evenly Matched is the only card you control, which it should be when activated, you can make your opponent banish a ton of cards, but they will only have 1 leftover. What makes this better is that it can be used from the hand if you control no cards. That is where this card can get nuts. 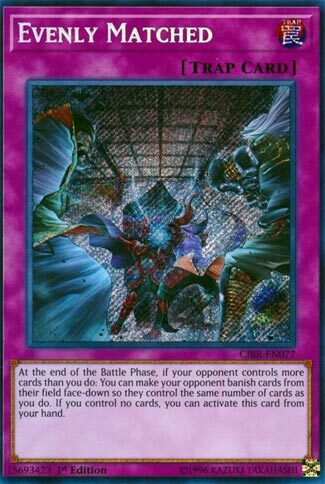 If your opponent stars with SPYRALs and controls like 8 or 10 cards, just go to the Battle Phase and end it immediately to activate this, and bam, your opponent banished 7 to 9 cards face-down… though with SPYRALs they are likely going to be +1 from their starting hand still, ha! This card is very powerful, especially in slower decks, but it is a great Side Deck option because of how it can just devastate your opponent. Evenly Matched is a very fun and potentially disasterous card for your opponent. I like what the card does, though I’m not a fan of a card that almost rewards you for being at what you hope should be a huge disadvantage, just balance things out. This card can only be activated at the end of the Battle Phase, and directly from your Hand if you control no other cards. Your opponent is forced to removed cards from their Field from play (face down) until they control the same number of cards. Your opponent can take a huge minus from this in an instant. This card sort of reminds me of Last Turn…it may not win a game for you, but you have to be in almost as bad a spot to use it. But I have to admit, it’s rather good.